« Why Doesn’t Hillary Learn any Lessons from the Slow Suicide of California and other High-Tax States? 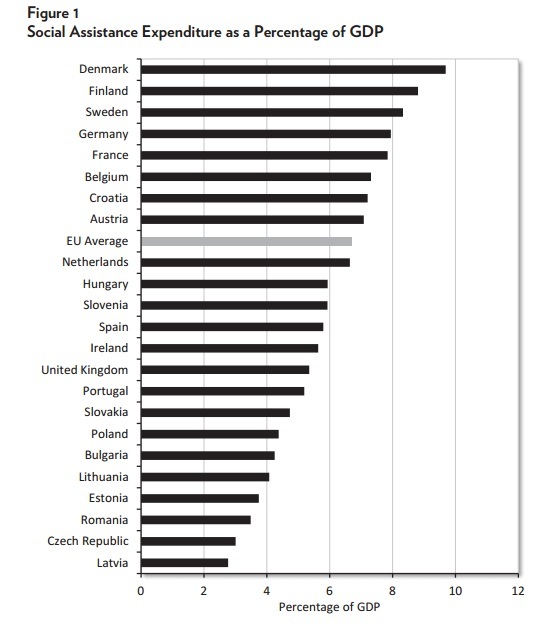 Which European Nations Have the Biggest Subsidies that Trap People in Poverty? Back in 2013, my colleagues at the Cato Institute, Michael Tanner and Charles Hughes, released a study looking at the value of welfare programs in various states. The most shocking finding was that the overall package of welfare benefits was greater than the median salary in eight states! And more than 80 percent of the median salary in half the states. That sounds like a hammock, not a safety net. No wonder taxpayers feel like they’re getting ripped off. This system has been bad for taxpayers and bad for poor people. 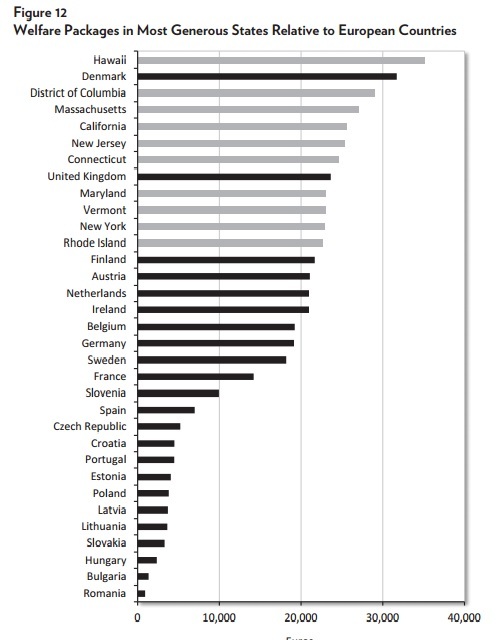 Now Mike and Charles have a new study that looks at excessive welfare handouts in Europe. They start with an elementary observation about how people can be trapped in dependency when government benefits are too high. If welfare benefits become too generous, they can create a significant incentive that encourages recipients to remain “on the dole” rather than to seek employment. Benefits in European Union (EU) countries vary widely, but in many of them, benefits are high relative to what an individual could expect to earn from a low-wage or entry-level job. And he highlights some of his main finding. ■ Welfare benefits in nine EU countries exceeded €15,000 ($18,200) per year. In six countries, benefits exceeded €20,000 ($24,300). Denmark offers the most generous benefit package, valued at €31,709 ($38,558). ■ In nine countries, welfare benefits exceeded the minimum wage in that country. Since poor people can be just as rational as rich people, think about the perverse incentive structure this creates. If you work, you give up leisure time and expose yourself to all sorts of additional costs, such as transportation, childcare, and taxes. So why endure those headaches when you can relax on the dole? Let’s look at some charts from the study. We’ll start with one on the overall fiscal burden of the welfare state. As you can see, nations in Northern Europe generally have greater levels of income redistribution, measured as a share of GDP. Very depressing numbers, particularly when you consider that European nations used to have small governments with very little redistribution. But this data only tells us about the overall burden on taxpayers. It doesn’t give us much information about the incentives of poor people. 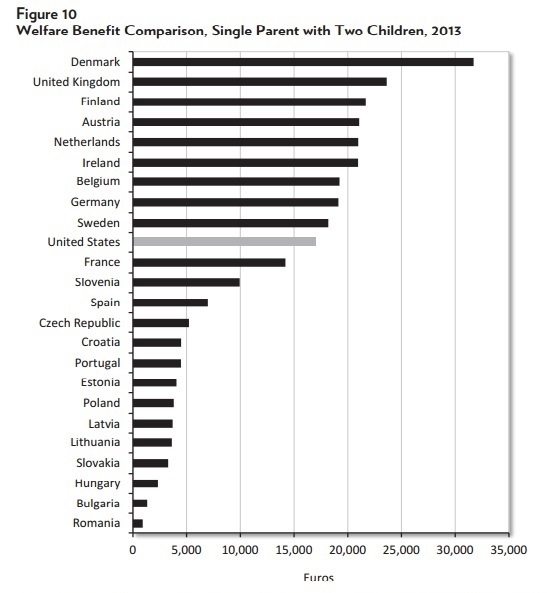 So now let’s look at a chart showing potential welfare benefits for a single parent with two children. Wow, Denmark must be a paradise for slackers. No wonder “Lazy Robert” is so happy. Though you have to wonder how long the system can survive. The number of people producing wealth has been stagnant while the number of people riding in the “party boat” has been climbing. Sooner or alter, those trend lines will cause big problems. You’ll notice that the United States also is included in the above chart and that handouts in America are not that different than they are on the other side of the Atlantic Ocean. Indeed, the value of redistribution programs in the United States is greater than what’s provided in France and only slightly behind the value of such programs in Sweden. The numbers are even more remarkable when you look at American states compared to European nations. Wow, Lazy Robert should move to Hawaii! But it’s not just Hawaii. Many other states, mostly from the northeast (and California of course), also provide excessive benefits. No wonder a record number of Americans are trapped in poverty. Let’s now shift gears and look at a very interesting finding from the Cato study. Mike and Charles uncovered an inverse relationship between handouts and labor regulations. In looking at the relationship between welfare and work, one additional factor should be considered. There appears to be an inverse relationship between the generosity of welfare benefits and the rigidity of labor-market regulations. That is, those countries with high benefits tend to have more flexible labor markets, and vice versa. …Nordic countries, in addition to Germany, the Netherlands, and a few others, have chosen to pursue what is often referred to as the “Nordic,” “Danish,” or “flexicurity” model. That version of the welfare state combines a largely deregulated labor market, one that makes it easier to hire and fire workers, with a generous safety net to cushion workers from the consequences of those policies. …In contrast, in much of southern Europe, countries such as Italy, Portugal, and Spain have smaller safety nets but much more tightly regulated labor markets. They effectively shift much of the social cost to employers. While these nations obviously have different approaches, the bottom line is still similar. …in southern Europe, the welfare benefits may not deter work to the same extent, but finding a job may be more difficult. Then again, in countries with flexicurity, it might be easier to find a job, but benefits and effective marginal tax rates are high enough to discourage workers from doing so. The result in both models is that workers are more likely to remain on welfare and out of work for longer than they otherwise would. P.S. I’m actually in Hawaii as I’m writing this, so the results from the last chart got me thinking. Hawaii is one of the worst states in the Moocher Index and it does have relatively high welfare benefits, so you won’t be shocked to learn there’s a very high tax burden. But a surprisingly small share of the population utilizes food stamps, and the number of welfare bureaucrats is amazingly low. P.P.S. Left-wing international bureaucracies such as the Paris-based Organization for Economic Cooperation and Development fabricate deliberately dishonest numbers when advocating more welfare spending in the United States. But we’d be much better off if we learned from the success of welfare reform in the 1990s and got the federal government out of the business of income redistribution. Sooner than later the whole thing will start slowly collapsing, the standard of living will drop for most people while the producers take their efforts elsewhere!!! Germany and Sweden are the preferred destinations of Europe’s migrants… wonder why? The same incentives exist at all income levels. It’s called the flattening of the effort-reward curve. For example, I was able to withdraw from work by a whole 50% while taking only a 10% take home pay hit, when the effect of taxes, reclamation of deductions, qualification for a few extra benefits, decreased Medicare contributions, commuting and childcare costs are accounted for. And I get to spend lots of time with my family, and have time to do yoga, play golf and trumpet, and comment on Mr Mitchell’s blog to boot; rather than be in an office and jcreate new positions of higher pay for some distant yet unknown bozos. Cancer cures? Ehhh they can wait. Nobody’s gonna die. So what if it takes us another thirty years instead of twenty five to find a cure for cancer. Small difference. Besides, with so many American people still unemployed, they can just grab someone from the unemployment line and have him do my work. In any case, even if they don’t, small price to pay to make for a kinder, gentler society where indolence and bad choices are quite a bit more comfortable. That is the road to maintaining top world prosperity. Growth down to a more European two percent trendline when world average is four? Ehhh, somehow the numbers will work out.